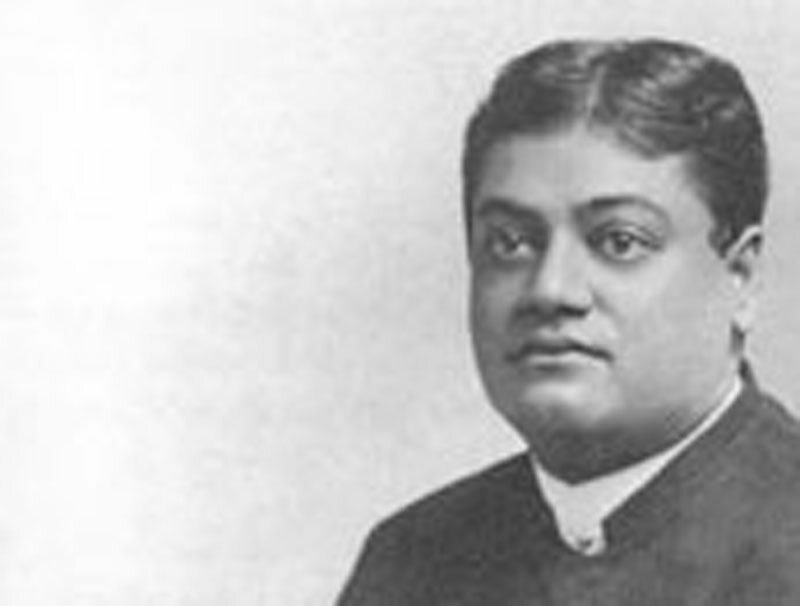 Bhavanath Chattopadhyay - People that Swami Vivekananda knew - Frank Parlato Jr.
As both blades of a pair of scissors are needed to cut a piece of cloth, so both self-effort and grace are needed to realize God. The grace of God is always blowing, like wind over the sea. A sailor who unfurls the boat’s sail catches the wind and reaches the destination smoothly. Sri Ramakrishna’s grace began to flow over Bhavanath Chattopadhyay’s life, but Bhavanath suddenly pulled down his sail, putting his spiritual journey in peril. His condition was like that of a man who puts his left leg in one boat and his right in another. Bhavanath ascended to a higher plane of consciousness by the grace of the Master, but mysterious Mahamaya entangled him and brought him back down to the world. Bhavanath was born towards the end of 1863 in Atulkrishna Banerjee Lane , Baranagore, a couple of miles away from Dakshineswar, to Ramdas Chattopadhyay and Ichhamayi Devi. He had one sibling, a sister named Kshirodbala. A good-looking boy with a fair complexion, Bhavanath had a simple, mild and devout nature. During the fourth quarter of the nineteenth century, Western influences brought about an upheaval in Indian society. Christian missionaries were trying to use Western education to convert the younger generation. In response, various indigenous religious and social movements sprang up to face the Western challenge by reforming India ’s religions and its ancient customs. At that time Shashipada Bandyopadhyay, a leader in the Brahmo Samaj, organized some youths in southern Baranagore and inspired them to carry out philanthropic activities. On 27 October 1872, Shashipada established the Students Club, which carried out various social programmes: popular education, women’s education, education for labourers, night school, Sunday school, moral training, a public library and so on. In 1876 Shashipada established the Atmonnati Vidhayini Sabha, an association devoted to the self-improvement of its members. Bhavanath was in charge of this association’s library. Narendranath Datta (later Swami Vivekananda) would sometimes take part in the discussions held by this association, along with his classmates Satkari Lahiri and Dasharathi Sanyal, who also lived in Baranagore. Thus Bhavanath became acquainted with Narendra. Due perhaps to Shashipada’s influence, Bhavanath joined the Brahmo Samaj. Narendra was also a member, and Bhavanath and Narendra eventually became close friends. Shashipada had met Sri Ramakrishna at Shambhu Mallick’s house and was very devoted to him. Bhavanath most probably heard about the Master either from Shashipada or from the writings of Keshab Chandra Sen, the famous Brahmo leader. (1) According to M’s account in the Gospel of Sri Ramakrishna, Bhavanath met Sri Ramakrishna either in late 1881 or early 1882. At any rate, M first saw Bhavanath and Narendra at Dakshineswar on 6 March 1882. Thrice blessed is this day of joy! May all of us unite, O Lord. As the Master listened to the song with folded hands, his mind soared to a far-off realm. When Kalikrishna bowed down to the Master and was about to go, the Master asked where he was going. ‘What is it about?’ the Master asked. The Master asked M, ‘Well, what is the cause of bhakti? Why should the spiritual feeling of young boys like Bhavanath be awakened?’ M remained silent. That silences my raging passions’ storm. Bhavanath felt intense renunciation and began to spend nights at Dakshineswar with the Master. His parents and relatives thought the Master was mad. They warned Bhavanath not to frequent Dakshineswar, but he did not listen to them. On 18 June 1883 Bhavanath and other young devotees shared a carriage with the Master to attend the festival at Panihati. On their way, the Master was in a light mood and joked with the youngsters; but as soon as he reached the festival grounds, he joined the kirtan party and danced, totally forgetting the world. ‘Bhavanath Chatterjee, the Master’s devotee from Baranagore, wanted to take a photograph of the Master. One day he requested him very strongly to give his consent, and on the afternoon of the next day brought a photographer along with him from Baranagore. He could not make the Master agree. The Master just went away near the Radhakanta temple. ‘In the meantime Narendra arrived on the scene and heard everything. He said, “Wait a bit. I shall put everything straight.” Saying this, he went to the veranda to the north of the Radhakanta temple where Sri Ramakrishna was sitting and started a religious conversation with him. The Master went into samadhi. Narendra went and called others and ordered them to get ready quickly to take the picture. ‘In the state of samadhi the Master’s body was bent on one side and therefore the cameraman went to make him sit erect by gently adjusting his chin. But as soon as he touched his chin, the whole body of the Master came up like a piece of paper - so light it was! ‘Swamiji then told him: “Oh, what are you doing? Be quick. Get the camera ready.” The cameraman took the exposure as hurriedly as possible. The Master was completely unaware of this incident. During this period Bhavanath became a teacher in Baranagore School , but the job did not last long. Soon after they were married, his wife became very ill, but by God’s grace her life was saved. Although Bhavanath was involved in family life, he did not have much attachment for worldly things. Since he was then desperately looking for a job, he could not visit the Master on a regular basis. Yes, you gain much by visiting those things. You realize that those articles of gold and the other things sent by maharajas are mere trash. That is a great gain in itself. When I used to go to Calcutta with Hriday, he would show me the Viceroy’s palace and say ‘Look, Uncle! There is the Viceroy’s palace with the big columns.’ The Mother revealed to me that they were merely clay bricks laid one on top of another. Again, how much a man suffers for his wife! Still he believes that there is no other relative so near. Look at the sad plight of a husband. Perhaps he earns twenty rupees a month and is the father of three children. He hasn’t the means to feed them well. His roof leaks, but he hasn’t the wherewithal to repair it. He cannot afford to buy books for his son. He cannot invest his son with the sacred thread. He begs for a few pennies from different friends. Master: ‘You must stick to one path with all your strength. A man can reach the roof of a house by stone stairs or a ladder or a rope-ladder or a rope or even by a bamboo pole. But he cannot reach the roof if he sets foot now on one and now on another. He should firmly follow one path with all his strength. On 14 September 1884 Bhavanath visited the Master at Dakshineswar. Narendra, M and other devotees were present. A scholar from Konnagar came to see the Master with some friends and he asked many different questions. When he and his friends later saw the Master in samadhi they were about to leave, but Bhavanath asked them to stay. When they finally left, the devotees talked about the scholar. The conversation turned to the glory of God’s name. 2. M, The Gospel of Sri Ramakrishna, trans. Swami Nikhilananda (Chennai: Sri Ramakrishna Math, 2002), 127. 3. Swami Saradananda, Sri Ramakrishna and His Divine Play, trans. Swami Chetanananda ( St Louis : Vedanta Society of St Louis , 2003), V.8.2.6. 4. Swami Chetanananda, Ramakrishna as We Saw Him (St Louis: Vedanta Society of St Louis, 1990), 468. 6. Vaikunthanath Sanyal, Sri Ramakrishna Lilamrita ( Calcutta , 1936), 335. 9. Akshayachaitanya, Swami Saradanander Jivani, (Calcutta: Model Publishing House, 1955), 348-9.